I always assumed the train was the greenest form of mass transit, but a friend told me I would be better off taking the bus. Could this be true? 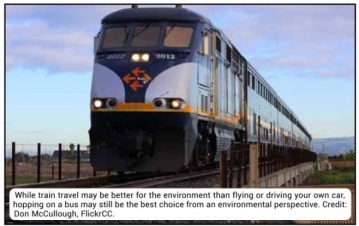 Indeed, trains seem greener, with some relying exclusively on electricity while others utilize a single diesel-powered locomotive to pull dozens of passenger cars. A landmark 2013 study in Environmental Science and Technology by researchers at the International Institute for Applied Systems Analysis (IIASA) and the Center for International Climate and Environmental Research (CICERO) backs up these findings. The researchers found that bus travel noses out rail travel in fuel efficiency and carbon impact on typical business or holiday trips ranging from 500-1000 kilometers (300-600 miles), generating only about 20 percent of the per passenger emissions as driving alone in a typical gas-powered car. Though buses are the current green leader, trains are catching up fast. All of Amtrak’s trains in its busiest Northeast Corridor now eschew the old diesel generators that used to power their locomotives, and run instead on an increasingly renewable supply of electricity. Some $10 billion in investment in high-speed rail by the Obama administration means trains are getting more efficient across the country as well. While Candidate Trump promised he would pour hundreds of millions of dollars into further boosting highspeed rail infrastructure, his 2018 budget does more to decimate Obama’s progress on the issue than augment it. Whether he will follow through with a plan to further bolster U.S. rail travel remains to be seen. In the meantime, while trains remain a viable green choice, choosing Greyhound over Amtrak might be the better option for the time being. CONTACTS: UCS, www.ucsusa.org; Amtrak, www.amtrak.com; IIASA, www.iiasa.ac.at; CICERO, www.cicero.uio.no; Greyhound, www.greyhound.com. EarthTalk® is produced by Roddy Scheer & Doug Moss and is a registered trademark of the nonprofit Earth Action Network. To donate, visit www.earthtalk.org. Send questions to: question@earthtalk.org.